Congratulations to Rose, the Atlantic Bottlenose Dolphin who lives at Discovery Cove, SeaWorld’s all-inclusive day resort. Her female calf was welcomed into the world Wednesday, February 12, at 5:35 a.m.
Congratulations Rose! Your calf is beautiful. The yet-to-be-named little girl is nursing and bonding with her mother, which is a good indicator that she’s doing well. 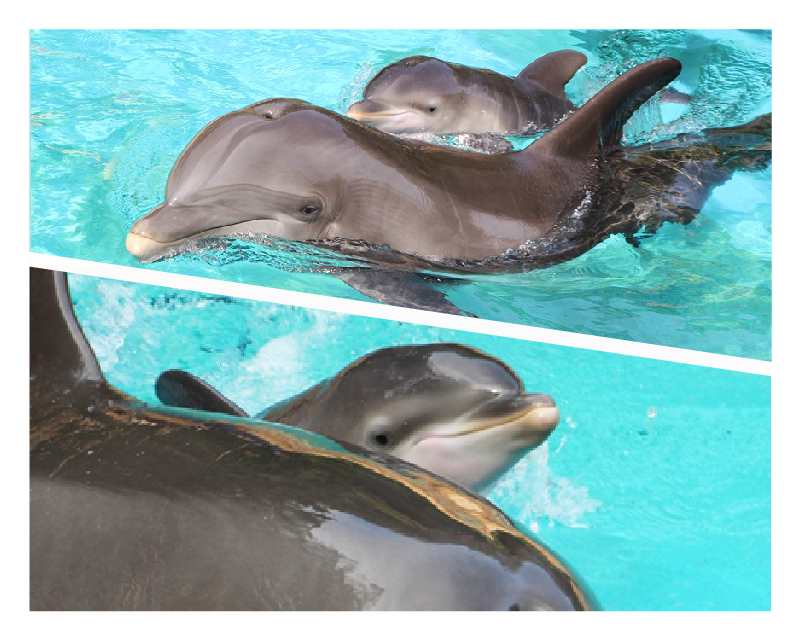 This is Rose’s second birth, and the 27th dolphin born at Discovery Cove since the park opened in 2000. 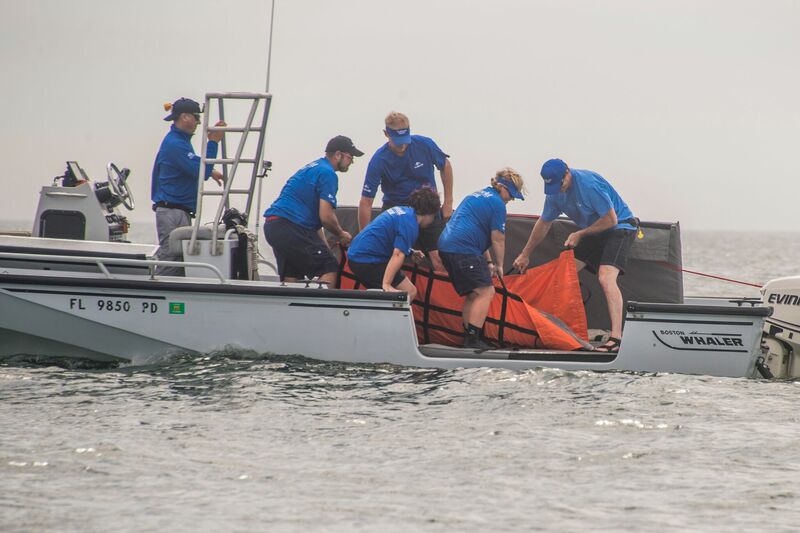 A baby dolphin, believed to be just 5 days old and with his umbilical cord still attached, was rescued Sunday, May 20, 2012 near Three Sisters Island in Volusia County. The male calf weighed slightly less than 35 pounds and was found in shallow waters under a mangrove. 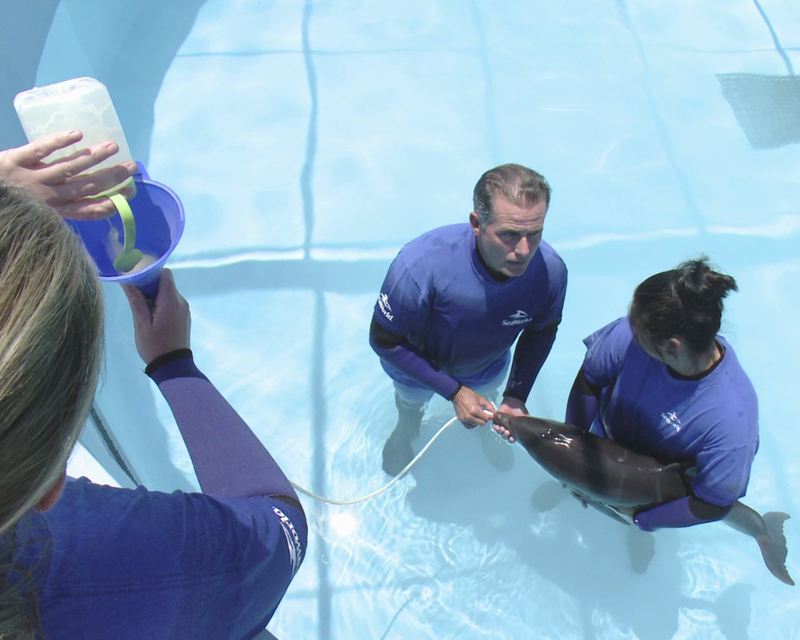 Initial tests revealed no major health issues, but SeaWorld’s animal team will manually tube-feed the newborn every two hours. Dolphin calves usually nurse for 12 to 18 months. 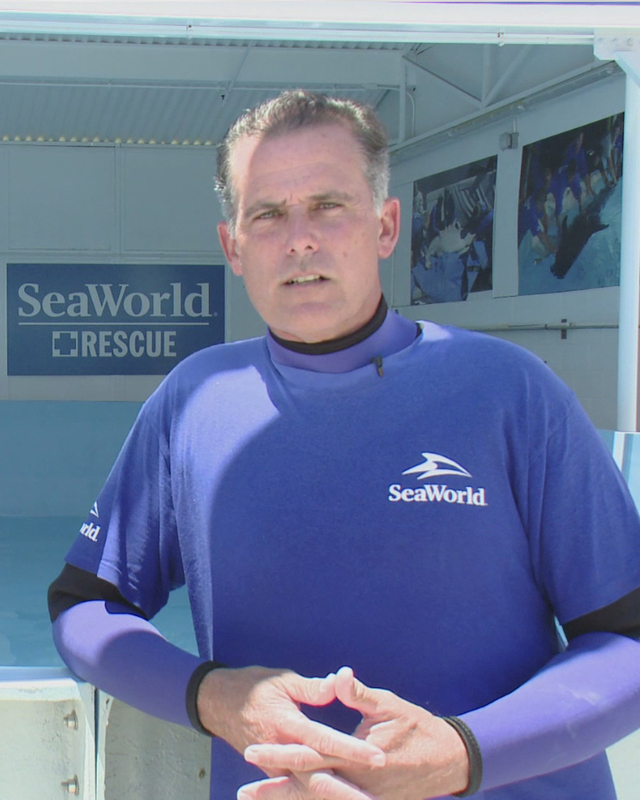 Pedro Ramos-Navarrate, Supervisor of Animal Care, along with SeaWorld’s animal team are working tirelessly to ensure the calf continues to grow and thrive. This successful rescue was the result of a team of Animal experts and volunteers. The Hubbs-SeaWorld Research Institute initially examined the dolphin. 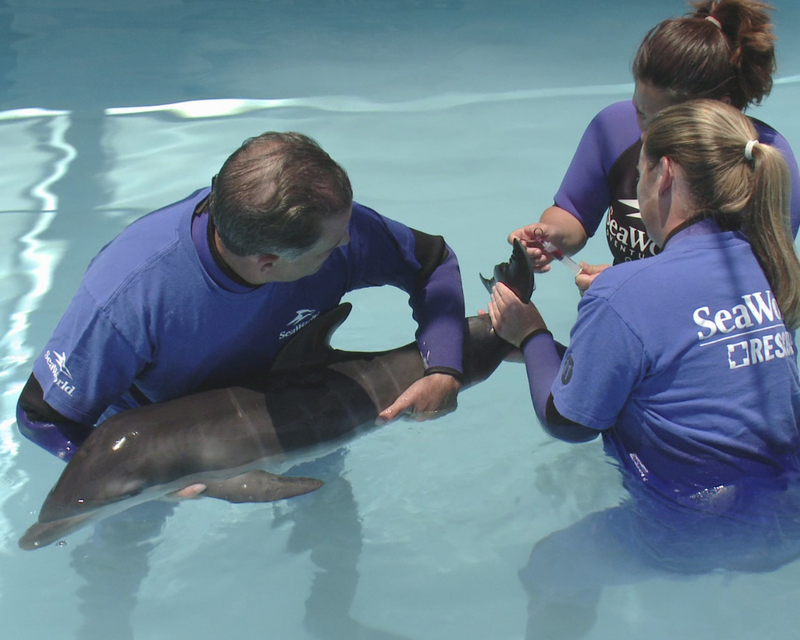 Once NOAA Fisheries Service authorized his rescue, SeaWorld’s animal rescue team brought the baby dolphin to SeaWorld for care. 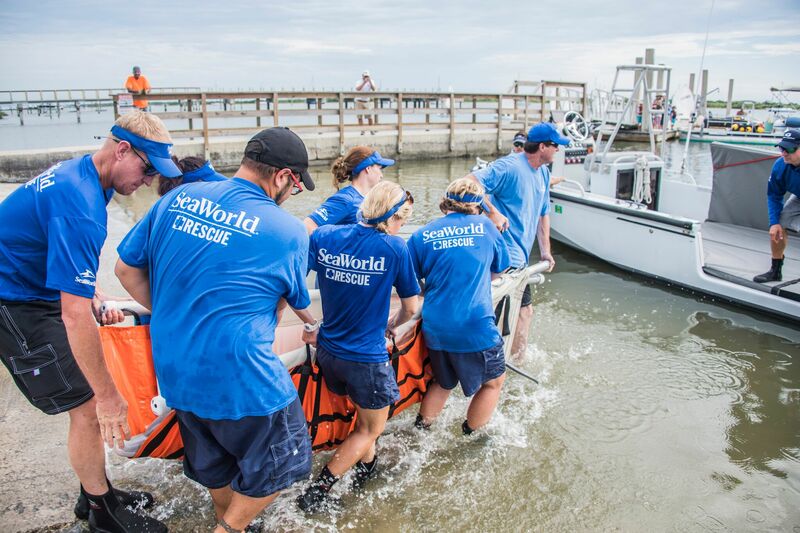 SeaWorld’s animal rescue team is on call 24/7 to save and care for injured, orphaned or ill animals. 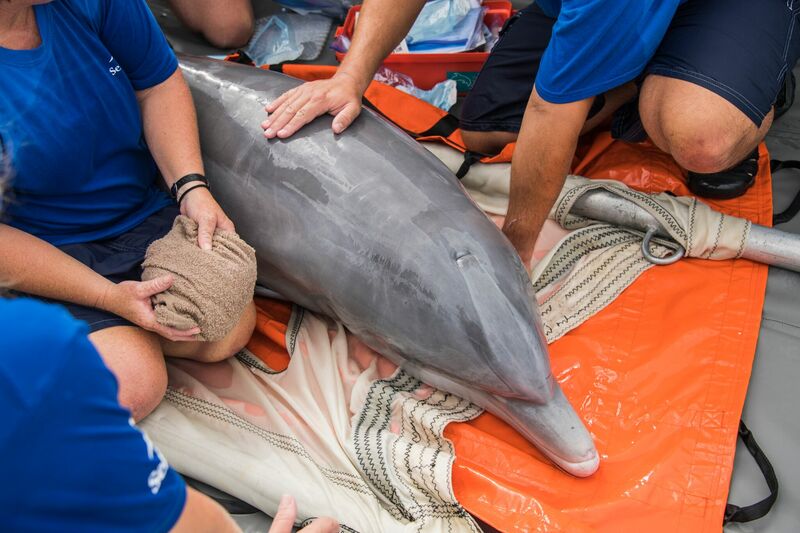 This is the first bottlenose dolphin to be rescued this year. My 4-year-old, Daniel, is used to being up close and personal with marine life. As a visitor to SeaWorld and Bush Gardens well over 100 times in his short life (not to mention countless visits to zoos and other animal-themed attractions) he’s pretty much a pro when it comes to interactions. Our visit to Discovery Cove, however, has raised the bar so much so that I fear his expectation of “normal” is forever altered! Walking into the check-in/lobby building, Daniel first noticed the incredible art. He bent over to examine the mosaic floor. “Look, Mom. It’s like waves,” he said as he then proceeded to show me how many shades of green were represented, and how many blue. His neck craned up: “Look, Mom, at the dolphins!” Above us graceful dolphins appeared to be floating, breathtaking fiberglass on steel crafted by artist Michael Linenbroker. He looked at it from multiple angles, checking out the white fish “swimming” with them. Our feast for the eyes had begun, and we’d only arrived minutes before. I knew he’d fall in love with Discovery Cove, but I had no idea it would be so hard and so complete. Everywhere he looked there were birds, tropical fish, marine mammals… you name it. 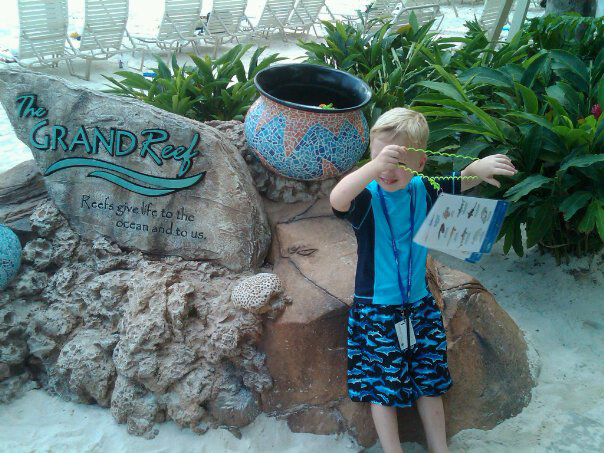 At the center of his fascination was the brand new Grand Reef. With a footprint of 2.5 acres and close to a million gallons of water and 5 million pounds of pristine, sifted beach sand, the Grand Reef is home to thousands of tropical fish and dozens of rays including spotted eagle rays that have a 5-foot wingspan! Behind glass we found eels and, holy moly, sharks! We balanced on rock formations (man made, like the removable coral so as not to be sharp) and bobbed and floated and swam to points near and far checking out the abundant marine species, and marveling at this unprecedented view into their world. 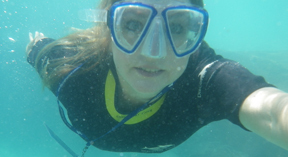 We did attempt the snorkeling gear, LOL! 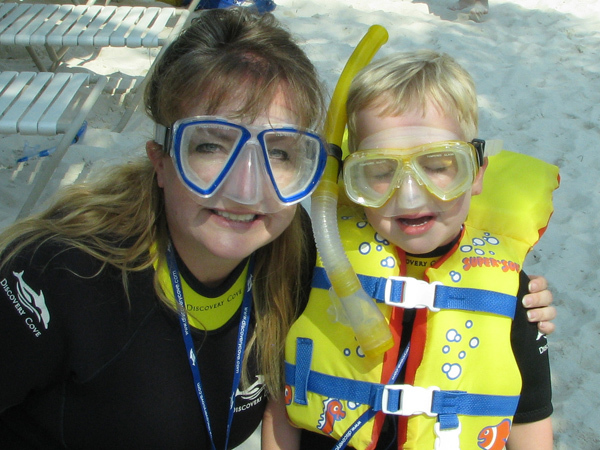 I would have loved it if my little man could have used the mask and snorkel to better see the curious and colorful creatures in our midst, but he may be a little young… this trip. He couldn’t quite get it into his head that something covering his eyes and nose (and being tight and pressing on his face) was a good thing. His mom, however, put the gear to good use (with dad nearby to watch the boy). Swimming nose to nose with a stingray whose eyes were larger than mine was awe-inspiring, I can assure you. “I don’t see how I could ever return to common life after this,” thought we all (quoting “Anne of Green Gables”). Sure you may have gotten goose bumps at SeaWorld interacting with the marine life and riding the awesome rides. And OK, your family has giggled with delight while whooshing down the slides at Aquatica…. But if you’re ready for your next BIG close encounter with all you love from the marine parks, do not miss Discovery Cove. I’m already counting the days until I, too, can return. Young children are naturally curious. Talking about events like this by discussing the senses is a super introduction to not only science, but language arts. And they learning to be good observers and communicators, all while recounting a fun, FUN show. We started with the five “primary” (or most-known) senses. What did we hear? Uplifting and up-tempo music, of course, but we also heard the sound of water splashing as the whales jumped out of the water, then BOOM landed again. 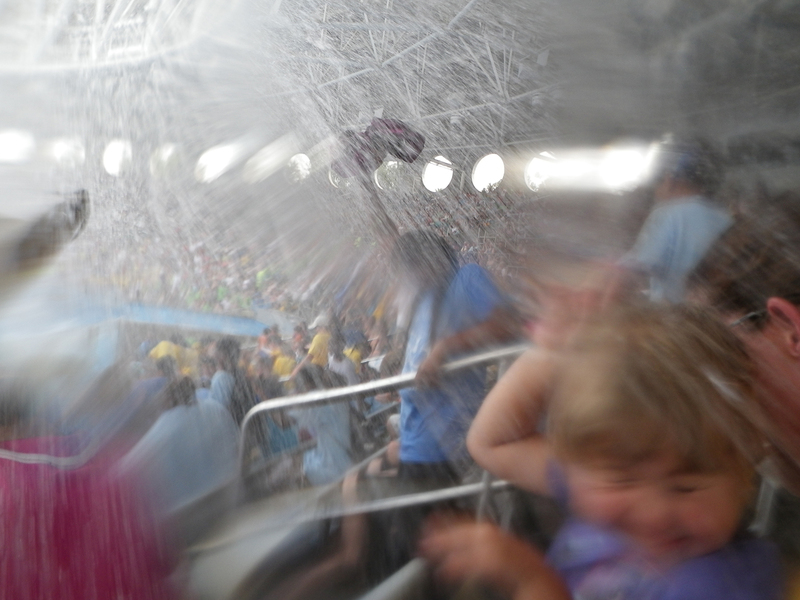 We heard the crowd giggling and screaming when they were hit with the splashes and the water crashing on the stadium seats. What did we see? Majestic, huge!, shiny black-and-white beauties, caring trainers, TONS of water, huge screens that moved, lots and lots of people having the time of their lives. We pointed out some of the whale’s anatomy: rostrum, fluke, blow hole, dorsal fin and eyespot. And look, up in the sky… it’s a bird. But he’s not part of the show! It’s just a white feathered friend trying to sneak a snack. How about feeling? Did we feel anything… unusual? Well, when we sat up in the upper balcony we felt the smoothness of the seat underneath us and the gritty concrete of the stadium walls. Normal stuff. On subsequent visits (when we sat in the Zone), however, we also felt wet… REALLY wet as we felt the splash from the pool! 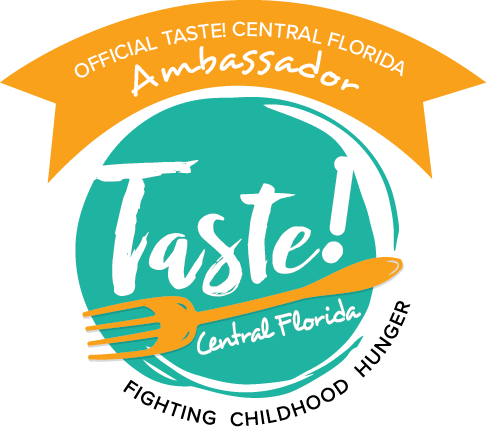 We smelled snacks, and the faint smell of fish when the wind caught it “just so,” but didn’t taste anything until the show was over and we re-filled our popcorn bucket (you certainly don’t want a full bucket getting soggy in the show, now do you?). There are more than five senses. It’s actually closer to 20. One of the many “lesser-known” senses we described is thermoception which, to my young child, we called hot/cold. One minute we were “enjoying” (ahem) the Florida heat and then WHAM! a wall of extremely cold water made our skin shiver as goose bumps appeared. Describing what we sensed not only helped fix the memories in our minds, but helped my son use his exploding language skills. One Ocean was fun. It was thrilling. It was (dare I say it?!) SENSEational! And it was, yet again, an educational experience for the whole family, cleverly disguised as a whale of a day. Training and Parenting Have Quite A Lot in Common! I’ve watched the various whale and dolphin shows at SeaWorld more times than I can count. One of the things I find most intriguing is the outpouring of love they show the animals and the seemingly endless supply of patience they exhibit… even when the animals have no intention of performing on cue. As an audience member, I can tell the hope is that Shamu will swim “that” way. But once in a while he just doesn’t feel like it. I watch the ballet of trainers moving around the stage… encouraging… hoping…. But no. Not now. And you know what? They just go to the next thing. It’s what I aspire to as a parent. Parenting takes a lot of hard work. (Insert pause where you say, “Well, no duh!”) Sometimes it seems to come effortlessly, while at others you may feel your child has literally been replaced by an other-worldly being who has, apparently, never, no never, been told certain rules, understood explained consequences, and hasn’t ever been allowed to get his/her way. What seems, to you the parent, like a simple request that will ensure a quicker chore completion so you can all get on to the fun is, to your darling, sweet-faced child, tantamount to a request to scrub the floor with a toothbrush. Wouldn’t it be great if there were ways to reinforce those positive behaviors we want from our children while having the ability to overlook ones that aren’t so great? 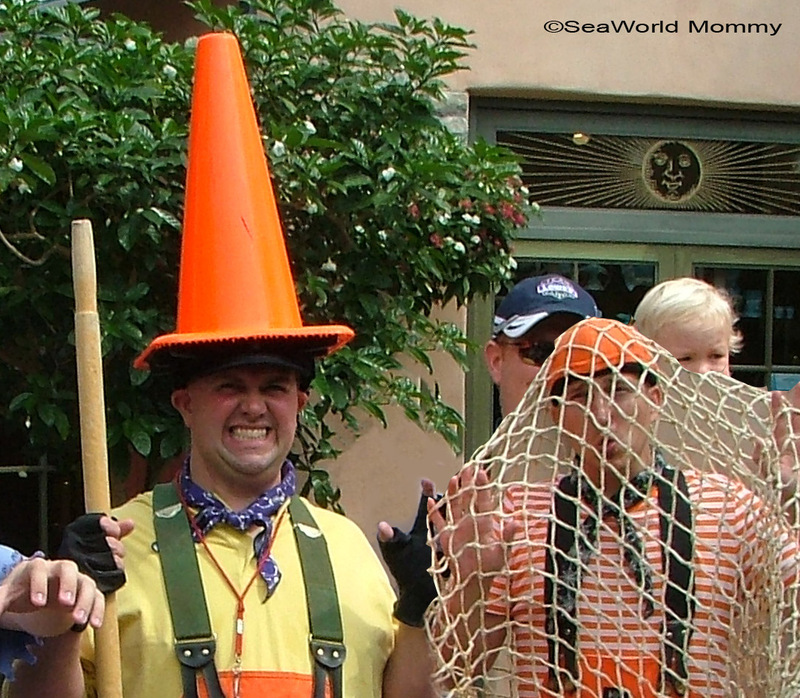 The trainers at SeaWorld use operant conditioning to encourage the animals to perform certain behaviors. Basically they positively reinforce particular activities so much that the animals do them more often because good stuff happens when they do. (When you go to work and receive a paycheck, you are conditioned. You do the work, you get the reward.) Trainers also seem to ignore behaviors that are unwanted. No one gets mad. No one goes to time out. Hummmmm. I don’t purport to be an expert trainer, and heaven knows I’m a parent in training. (Um, universe, if you could throw me a “good girl” fish right now that would be swell.) I can say, though, that I have literal goosebumps watching the whales and dolphins majestically leap through the air or twirl through the water. And yes, I have had tears in my eyes seeing the overwhelmingly apparent mutual affection the trainers have with those in their care. My child does not (poor thing) have a team of people who spent years in training to learn how to care for him. It’s just me and his dad. And we’re learning as we go. We don’t always respond with patience. And we have, from time to time, focused on the negative. Oh, and all right, I admit it!, we’ve been inconsistent when consistency is what he needs most. Sigh. It is my hope more than anything that my child grow up to feel secure and loved… so much so that his behaviors exude both confidence and compassion although I won’t expect him to swirl through the water like a graceful dolphin and pose on the mark. OK, I might want him to smile for the camera if Grandma is taking a picture. What! No judging! I’m still her child and certain behaviors are reinforced…. My toddler loves to play “peek-a-boo.” For humans, the game teaches object permanence. Just because Mommy is hidden by her hands, she’s still there behind them. 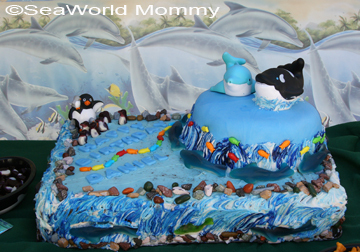 It makes me wonder if that’s what the dolphins are doing in the Dolphin Nursery at SeaWorld. As a frequent visitor to the park, I make it a habit to drop in on the bottlenose babies. Which ones are still nursing? Who’s growing up fastest? How tired is that mother of her child? Whenever I visit I usually go to the same spot on the wall… then wait. It may sound absurd, but I swear some of them recognize me. I’ve found that a lot of the time two particular dolphins would make their way to my spot by the wall and begin bobbing up and down out of the water. The behavior is called “spyhopping” and scientists believe it is done for obvious reasons… to view the world above the water (after all, echolocation is not useful in air). They seem, though, to be interested enough in the motions to continue as I “play” back. One bobs down and up. I crouch down below the wall and up. Dolphin. Human. Dolphin. Human. One day we took turns for at least 4 minutes. Back and forth. I see you. I see you! I may be anthropomorphising by thinking they enjoy our little game of peek-a-boo. Maybe they just want to see if that lady is still there. Maybe I look like a trainer or, more likely, someone with food. I think that what I spy with my little eye is a beautiful creature who, whether or not she intends, allows me to feel connected with the sea and with the world in a soul-inspiring way.